At Alcon Entertainment in Beverly Hills, Joe Bandy ’19 is getting to see Hollywood’s underbelly—full of private guilds, hordes of untapped movie scripts and social media savvy film directors. He’s rubbing shoulders with the very people who brought audiences movies like The Blind Side, The Sisterhood of the Traveling Pants, P.S. I Love You, The Book of Eli, Prisoners and Blade Runner 2049. 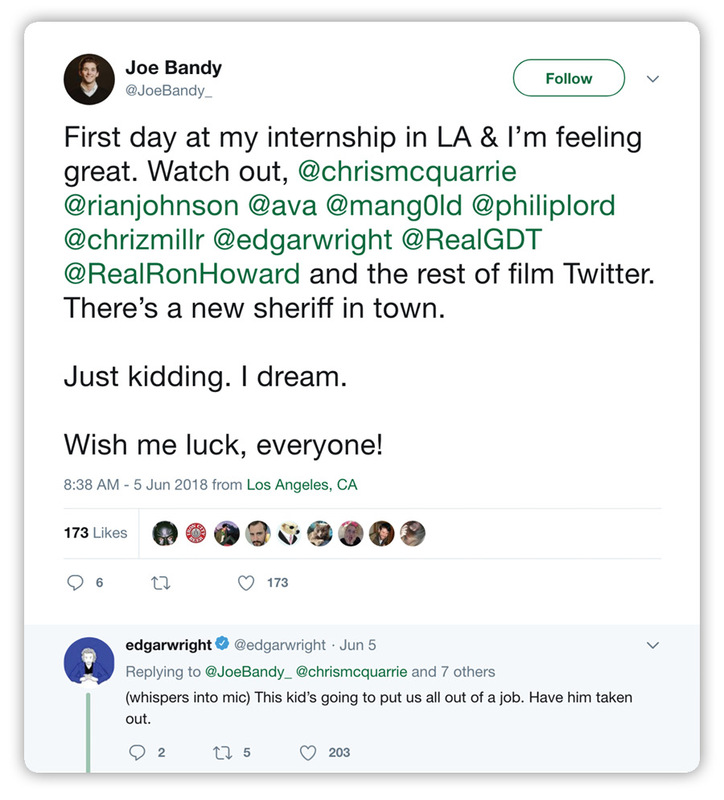 His first day on the job, Bandy announced his “induction” into Hollywood to all of his favorite directors and screenwriters in the Twittersphere. And they gave him the social media welcome—a swarm of likes and comments, some even from bigwigs like Mission Impossible Director Christopher McQuarrie and Baby Driver Director Edgar Wright. But, perhaps the warmest welcome came from James Luckard, development coordinator for Alcon, who is teaching Bandy to write coverage for movie scripts. Luckard has a page on IMDB with several credits to his name, but because Alcon is between productions right now, he has time to walk Bandy through the art of script coverage—something Bandy compares to a book report but for movie scripts. After reading through a script, production companies can do one of three things: pass, consider or recommend. If they pass on a script, they are obligated to say why, which is why script coverage writers are considered the gatekeepers of Hollywood. As it turns out, very few movie scripts survive rounds of coverage. Even scripts that go on to be produced spend an average of five to seven years in development before a company like Alcon even picks them up, with the intent of turning them into feature films. Luckard has made a point to teach Bandy how to identify good scripts from bad ones. In the process, Bandy has come to learn something about storytelling in general: Bad scripts often try to, as the cliché goes, reinvent the wheel—to do something that’s never been done before. But in Hollywood, Bandy has learned that even the best script writers, producers and directors actually like the wheel. Sure, they might sand it down, paint it and repolish it, but they aren’t going to start from scratch. After reviewing biopics alongside scripts that “are trying too hard to be too many things,” such as a romantic comedy/thriller, Bandy has learned that although there is sometimes a creative pressure to invent something entirely unprecedented, it doesn’t always make for the best movie. Part of what makes a story good is its simplicity—when it feels less artificial.